The original dress is silk faille, with a woven dot, and embroidered or woven with large silver floral sprays. I'll have to compromise on the faille (wow, expensive) and the embroidered florals - my embroidery skills, particularly with bullion, aren't up to snuff, and it would take me, like, the rest of my life anyway. Janet Arnold, Patterns of Fashion 1 . Very very similar, even has the comperes button front. The nice thing about sacques is that there are plenty of patterns and information available. 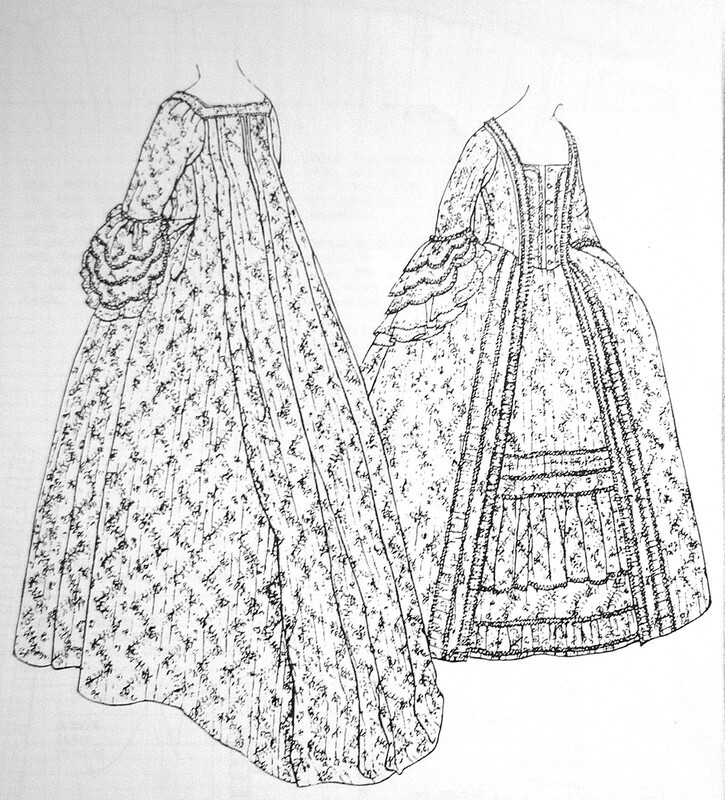 I will most likely use the pattern in Janet Arnold's Patterns of Fashion 1: Englishwomen's Dresses & Their Construction C. 1660-1860 . I've dubbed this someday-soon project "The LACMA Sacque-ma." More to come, I promise you! YAY! So beautiful!!! This style dress is my absolute favorite!!! Do you know Janea Whiteacre from Colonial Williamsburg? Sacques are so much easier if you drape them per her directions than if you try to follow what's in Janet Arnold as if it's a pattern. I found this out after my first saque nearly drove me insane. That's going to be gorgeous and I can't wait to see you do it. I'm pretty sure the floral patterning in the original is brocaded in, no need for embroidery. Yay! finally a Robe a la Francaise, Can't wait to see the finished dress! NOM. That is one delicious dress, and I can't wait to see the finished product! Awesome! I love the blue and gold, as well, and I'm glad your spreading out to a new type of gown! You could always hire someone to embroider a bunch of gold-things to put on your dress--Mary Corbet is in Kansas! That fabric is perfect! For the flowers, what about using Liquid Leaf to paint the designs on? http://www.plaidonline.com/liquid-leaf-silver/89/6180/product.htm It's a little expensive at around $7/bottle, but it really does look metallic once it's applied. I love using it for fabric painting. Oooo! I like this idea very much. I will give it a try. Thank you so much for the recommendation! Marquise.de's instructions for a saque (in her menu "contouche") are really easy to follow, too! They look complicated, but if you just make sure to follow them step by step, you'll be fine. I sucessfully made a saque with her instructions as my first big sewing project ever (before that, all I had ever sewn was a simple princess seamed elven dress, a chemise, stays and pocket hoops). I used the same Janet Arnold pattern as a starting point. Thank you for the link. I will give her tutorial a try, for sure. I need all the help I can get! I can't believe the beautiful match you found for the COLOR!!! Just begs to be done! Also, with the cut, I also can't believe how the sacque back doesn't intrude on the line of the bodice, when seen on the mannequin from the front. JUST the right amount of fabric, I guess. As to the metallic embroidery, could you find some embroidered lace and applique it onto the dress fabric? or is that just too costume-y, taking the cheap way out??? I shall endeavor to keep the lines clean, as you observed. I don't have much (any) experience with this style, though. I made a pet en l'air that was too tight once, but other than that, I'm a babe in the woods on this one. Mock-ups to the rescue! The color of the fabric is wonderful. Delectable Mountain Cloth in Brattleboro VT has an exquisite fabric selection. Jan shops NYC and sells at a fraction of the cost you would pay in NYC. She is very accommodating and if you tell her what you want will send you samples etc. PS I do tambour hook embroidery check out my blog if you ever want some appliqués made. Can't wait to see the finished product!! I've worked with the same fabric in black. It's super thin and frays like mad, but if it's possible I think the wrong side is even nicer! Just a heads up...because it's arriving from India it's likely to be opened by Customs. To keep shipping costs down the seller just slips the folded fabric in an envelope, so when the customs officer used a razor to open my package they sliced through many layers of fabric in the process. Luckily I could work around it for the most part, but if you do order from them you may want to ask that they add a little more packing material to protect the fabric. Super excited to see this dress! Ah, excellent, first-hand experience! I was wondering how thick the fabric was, a little concerned it might be too thick, but your words put me at ease...except the part about customs slicing through your yardage. GAH! I will be sure to ask for extra packaging when I order. That sounds like a flippin' nightmare! I've made this one too! It was my first robe à la française. 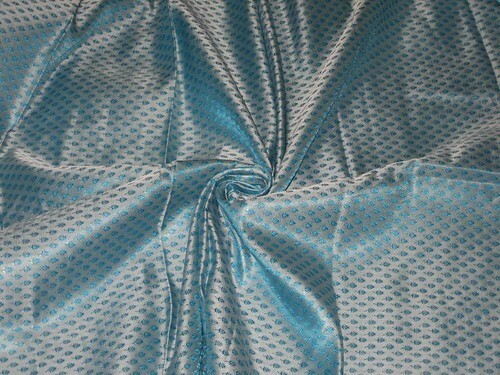 I used an embroidered poly taffeta. It was warm as heck, but it looked nice.